Climbing started at Wallcliffe in the early 1990s. The cliff is located on Nature Reserve No. 8431. It is important to note that local government (Shire of Augusta-Margaret River), not Department of Parks and Wildlife (DPaW) is responsible for the management of this reserve. In the late 1990s, the local council passed legislation banning climbing. The reasoning centred around minimising disturbance to the area and preserving Aboriginal heritage. The shire ignored the majority of CAWA’s numerous attempts to communicate with them, except for meeting representatives at the site once. Refusal to engage with CAWA resulted in us exercising our rights under the Western Australian freedom of information act 1992 (the FOI Act). An application was lodged to obtain the shire documents relevant to the issue. They revealed that the legislation had been driven by Mark Hohnen, then owner of Wallcliffe House and Helen Lee, owner of Bushtucker River and Wine Tours. They disliked sharing with another user group even though the reserve was gazetted for public recreation. Climbers demonstrated both in town and at the reserve. It was argued that climbers were responsible and respectful of the environment. 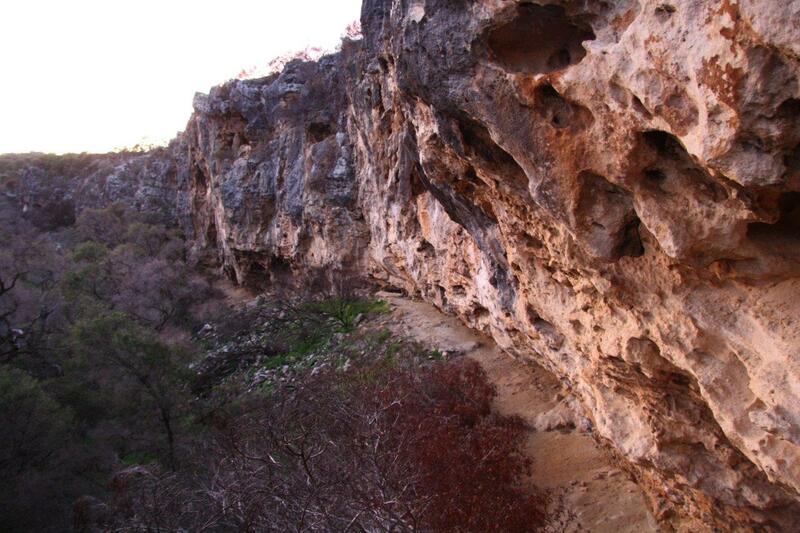 At the time, the crag was not listed as an Aboriginal site of significance. CAWA made a submission to the parliamentary committee that oversees local legislation, complaining that the shire had discrimminated against one user group and their solution to managing the reserve was to ban climbing. We were fortunate at the time to have the assistance of a climber who was also a lawyer. The legislation was deemed to be discrimminatory against climbers and was overturned. While the shire has the right to manage the reserve, management by banning a user group and refusing to communicate with them was considered unacceptable. The local government passed subsequent legislation prohibiting placing any new bolts (not replacement bolts) or new climbs. And climbing continued. (c) resist an authorised person impounding climbing equipment used in contravention of subclause (a) and (b). 2. The rock face and cave are listed as an Aboriginal site of significance and protected under the Aboriginal heritage act 1972. The act states that it is an offence to excavate, destroy, damage, conceal or in any way alter an Aboriginal site in a manner not sanctioned by relevant custom. Unfortunately, CAWA has not been approached, consulted or even advised of the above developments by the relevant governing bodies. It is possible that the local government restriction may have been in place for some time before 2013 but it is not clear exactly when it was enacted or whether those involved had knowledge of the previously agreed access or that similar legislation had already been overturned. As with all government departments, staff change over time and communication is often poor. Whilst this is disappointing, it is not entirely surprising. However, the far bigger issue is point 2. The listing on the Aboriginal Heritage Enquiry System does not indicate when registration of the site came into effect. CAWA’s official position is that all climbing activities at Wallcliffe should cease until further notice. It is possible to seek permission to climb on registered Aboriginal sites. However, any perceived disrespect for the area (for example, by continuing to climb there) and protections will negatively affect any application made. It is pointless tackling the local government legislation, before seeking and obtaining approval for climbing access from the Department of Aboriginal Affairs. Unless all climbers are willing to respect the current restrictions, it is also pointless for any group to spend months working hard to regain access. Our collective behaviour as a user group will impact significantly on any application. Permission must first be obtained from the Department of Aboriginal Affairs to climb at Wallcliffe. Only then is it worthwhile to commence negotiations with the shire. The former is a complex process, involving applications and appearances before panels and where a decision may not be made for twelve to eighteen months. For this reason, the assistance of a lawyer who is also a climber and willing to give their time to the cause, is almost critical. Not just to assist with all of the red tape but to provide support at presentations where the panels will have their own lawyer present. It is also important to be presenting a professional case to any panel. The process is long, labour intensive and requires complete focus. For this reason, CAWA is not in a position to take on this issue alone. We simply don’t have the resources and committees change over time. There are limits to what a small group of volunteers can do. What is required now is for a group of articulate, committed and experienced climbers, preferably including locals, who are willing to take this on and see it through until its conclusion, however long that takes. Ideally, the group would be comprised mostly of professionals (including a lawyer), at least some of who also have experience of dealing with legislative processes and ideally heritage issues. Being a very specific local issue, the application will benefit greatly from the involvement of local climbers with strong ties to the area, when presenting the case to Aboriginal Affairs. It will also make any on site meetings much easier to achieve. There are very sound reasons for being so specific about the recommended composition of the group who takes this on. In short, it’s not my personal opinion. I have it on good authority that it will impact on the outcome. CAWA, along with other individuals who have significant experience in this area, will provide support and guidance to the group who steps up to take this on. Just to be clear, CAWA is not putting together this group. Climbers need to take responsibility for doing this themselves and then approach CAWA for discussion once a group has been formed. It is up to the climbing community to decide whether Wallcliffe is important enough to them to stand up and fight for access. Dena, let me know if I can assist as an industry rep.